Welcome to another episode of SunCast, Solar Warrior! Today's conversation is with another power hitter whose built a sustainable and growing business out of what she loves to do. 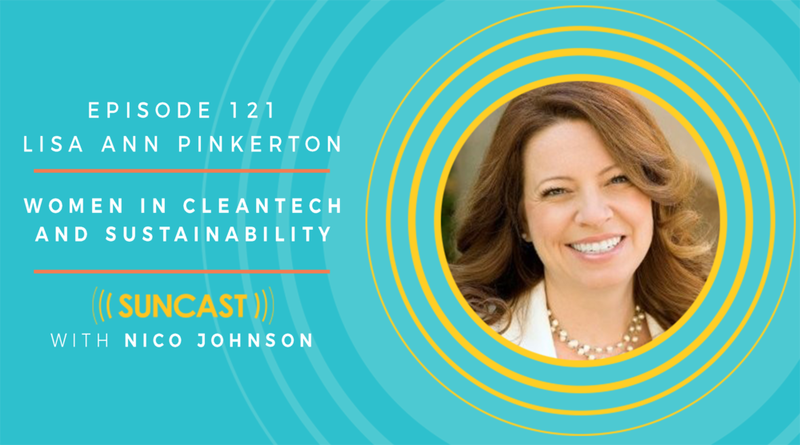 Lisa Ann Pinkerton and I have many things in common, but chief among them is a love to share cleantech stories with the world, but we go about it in slightly different ways. So I was intrigued to better understand how and why she’s been able to build a loyal client base of rabid ‘fans’ of her work in the past 7 years. In an era when most clients turnover every 18 months, her company, Technica Communications, has managed to retain clients from as far back as 2012! After this interview, it was clear to me why: when you get a pro on your team, you don’t want to let them go! In addition to being named a Women of Influence by the Silicon Valley Business Journal for 2017, Lisa Ann is founder and Chairwoman of Women In Cleantech & Sustainability, which will host the upcoming WCS Talks at the Google Campus on November 3rd. WCS Talks is an annual TED-style event hosted by Google, including the first female-focused startup pitch competition for the cleantech and sustainable industry. As a SunCast listener, you can get a special 25% discount on your WCS Talks ticket by using the code “SunCast” at checkout! Lisa Ann started her career as a broadcast journalist for nearly a decade. Her work has been broadcast on National Public Radio, PBS Television, NBC and other US news outlets. It was a joy to finally get a full interview with her to discuss how she transitioned from a radio career to become a clean tech marketing maven. And it’s always great to share the mic with someone who’s got professional voice training! I explored Lisa Ann’s past to uncover some of the tricks of the trade she has ported over from her journalistic and radio career. I was especially surprised to learn one of the key hiring criteria she credits for her success! You’ll be glad you tuned in.